Part of succeeding in the freelance world is having partners you can depend on—most often, for me, that happens with good, solid graphic designers and web designers, and I am blessed to have several. Freelance Follies Episode #6: “A Second Opinion.” Because I really, really love when third parties get involved in the writing and editorial approval process. Freelance Follies: Can you just wordsmith it a bit? 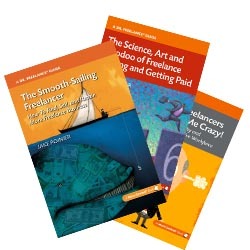 You can see all of the Freelance Follies video shorts at DearDrFreelance’s YouTube channel.